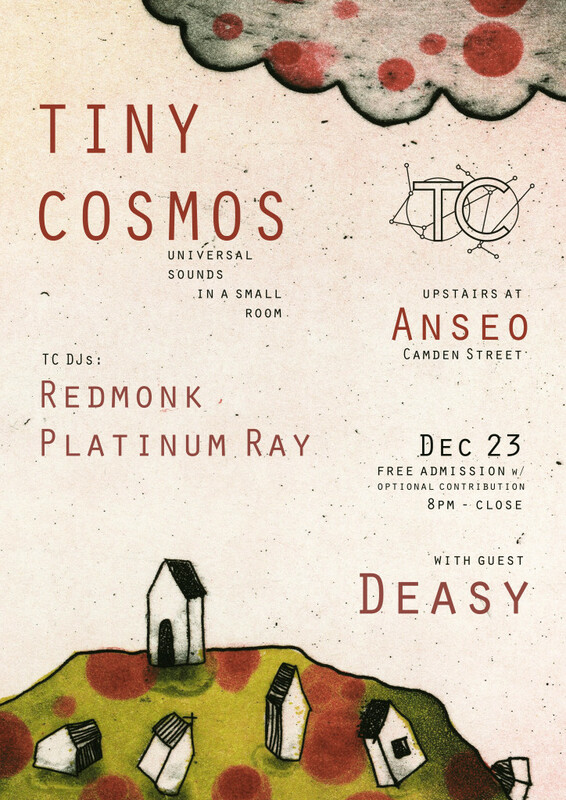 So my man Platinum Ray and myself are doing a second Tiny Cosmos night after the success of the first one. Delighted to have the legend that is Deasy as our special guest, you might know him if you’ve ever been to the Globe on a saturday night in the last 20 years, that’s him pon the decks. Upstairs in Anseo this Friday 23 December, 8 bells till 1. It’s free in but donations are welcome as we have to rent the sound system ye know? Expect the usual mixed bag of B-sides, weirdo disco, post-punk strangeness and kosmiche klatterfunk for your body parts. This entry was posted on Thursday, December 22nd, 2016 at 3:23 pm and is filed under Music. You can follow any responses to this entry through the RSS 2.0 feed. Both comments and pings are currently closed.